Celebrations without confetti are impossible to imagine. Confetti has become a symbolic as well as a literal sense of celebration. Well, confetti might be a modern thing but the concept is age-old. In the middle ages, it was a common practice of throwing objects at a carnival or a parade in Northern parts of Italy. People of different stratum threw different objects like nobles threw candies and flowers, dames threw eggshells filled with perfume and some especially the less fortunate, even threw rotten eggs on the nobles and other upper-class people. At the end of the 16th century, the 5th Duke of Frias—Juan Fernandez, banned the throwing of eggs which affected the throwing of other things also. After a century, the custom resurrected, in the form of throwing small sugar-coated seeds. As these sugar-coated seeds were expensive for lower classes, they replaced it with chalk balls. Time went and throwing the chalk balls became dangerous and soon were replaced by mud balls. For the last time in the 19th century, the throwing object got a permanent replacement which was paper streams. In the year 1875, an Italian businessman named Enrico Mangili started selling paper streams which came to be known as confetti (after the Italian confectionery which was basically sugar-coated almonds). Confetti is a great wall decor and wall art idea, especially for kids’ rooms. Just like everything else could go on a wall decal, confetti is a great idea for a wall sticker. If you want to add some sweetness to the walls of your kids, confetti wall art is the thing you need to do. 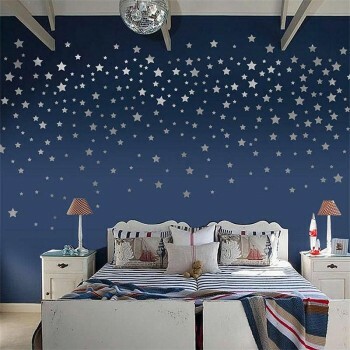 Confetti wall decals for kids wall decor could be fun as well inspiring. The best part of it is, you could get customized wall decals on which you can put your kid’s favourite confetti, be it dots, circles, triangles or anything.